Can our devastating floods be stopped? An amazing group of experts and thought leaders are coming together Tuesday Nov. 28 at 7 p.m. here to discuss — perhaps debate — the Houston region’s dangerous flooding and countermeasures. 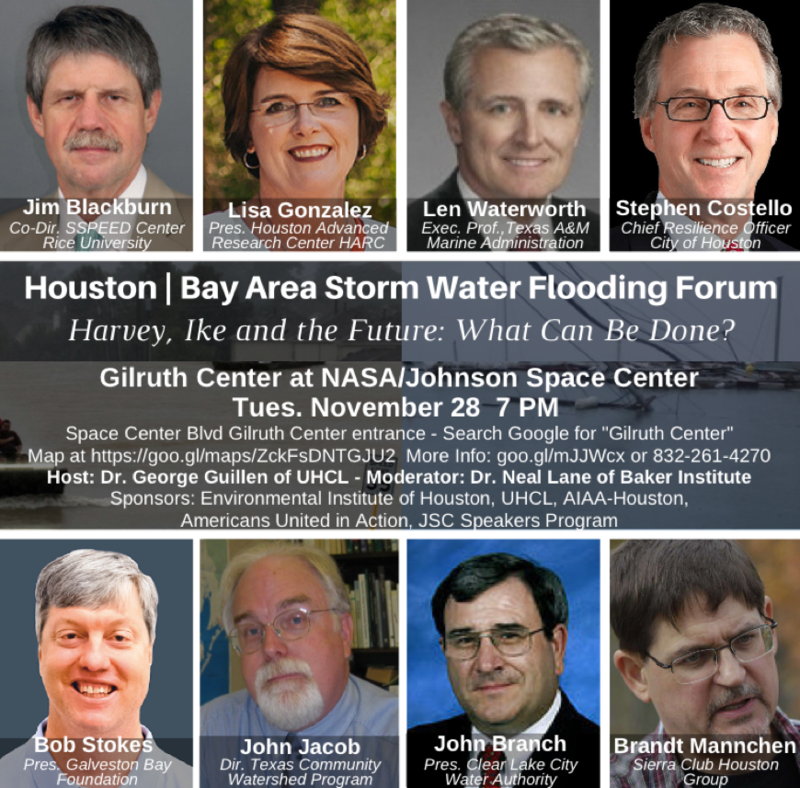 They’ll address the problems and solutions for major rain event flooding and hurricane storm surge flooding at a free, public forum at the Gilruth Center at NASA/Johnson Space Center. Jim Blackburn – Co-chair, SSPEED Center, Rice U.
Dr. Neal Lane – moderator – Sen. Fellow, Baker Institute at Rice U. Millions of Houstonians and neighbors are at risk from systemic but unpredictable floods that take lives and destroy homes. What can be done to stop storm water flooding? The speakers will address critical issues and past mistakes, and present proposals for protecting Houston region and Bay Area residents from dangerous, deadly storms like Hurricanes Harvey and Ike. They also will take questions from attendees and discuss answers. Get the information you need to support important government actions. Residents across Houston and especially the Bay Area with its 1-2 double-threat of flooding will learn the important issues to assess initiatives and determine best investments to support. While the government and businesses will shoulder major costs of improvements, ultimately taxpayers and customers will pay the bill. Everyone needs the knowledge to be engaged to ensure a safe and prosperous future. For more information and optional RSVP free tickets go to: https://americansunitedinaction.wordpress.com/get-involved/storm- water-flooding- forum/. The Gilruth Center, at the back side of JSC property, is accessible to the public via “Gilruth Center” entrance off Space Center Boulevard, between NASA Parkway and Bay Area Boulevard. Search Google Maps for “Gilruth Center” or enter https://goo.gl/maps/ZckFsDNTGJU2.